As part of his ongoing efforts to get Israel and the PA talking, John Kerry hosted talks with special Middle East envoy Tony Blair. As part of his ongoing efforts to get Israel and the Palestinian Authority back to the negotiating table, U.S. Secretary of State John Kerry on Thursday hosted talks with special Middle East envoy Tony Blair,. The two men met privately for more than two hours in the U.S. ambassador's residence in Rome, after Kerry also talked earlier in the day with Jordanian Foreign Minister Nasser Judeh, reported AFP. "For 30 years or so there has been a pent-up demand to try to resolve the issues of the Middle East and it is clear when left to a vacuum or when left to delay, bad things happen, things happen that work against the possibilities of peace," Kerry earlier told a press conference after meeting with his Italian counterpart Emma Bonino. "People who are denied peace can ultimately find other means to try to satisfy their aspirations," he added, according to AFP. On Wednesday, Kerry also met in Rome with Justice Minister Tzipi Livni as he pursues efforts to kick-start the talks stalled since 2010. During the meeting he announced that he will be returning to Israel in late May. Bonino said the Italian government was very pleased that "Rome is becoming a diplomatic crossroads" and praised Kerry's "tenacity in trying to open up any different avenues" in the search for new peace efforts. 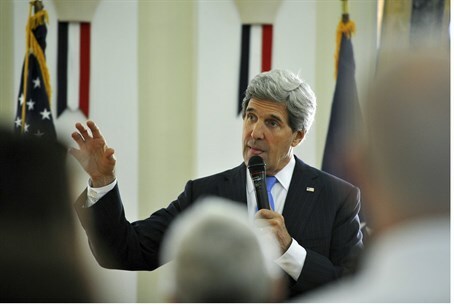 Kerry told reporters that he believed both Israel and the PA were serious about peace. "Israel needs guarantees for security, the Palestinians need guarantees for a state that they can be proud of, that is a contiguous state," he said. He cautioned again that the efforts would be kept private to give everyone the chance "to make tough judgments in their own appropriate space." "This has gone on for a long time, and the impatience level is building up in many places with all of the respective dangers attached to that," he warned. The PA leadership has imposed endless preconditions for talks with Israel. PA Chairman Mahmoud Abbas demanded a construction freeze in 2010 and, when Israel complied under pressure by U.S. President Barack Obama, Abbas refused to sit down and negotiate. Abbas recently told Kerry that Israel should freeze construction in Judea, Samaria and eastern Jerusalem and release terrorist prisoners, especially those arrested before the 1993 Oslo Accords, before any resumption of peace talks. Prime Minister Binyamin Netanyahu said last week that the conflict is rooted in the Arabs’ refusal to accept Israel’s existence as a Jewish State. “The root of the conflict is not territorial. It started a long time before 1967," Netanyahu said. "The Palestinians' lack of will to recognize the state of Israel as the national state of the Jewish people is the root of the conflict," he added. In proof, he pointed to the Israeli withdrawal from Gaza in 2005, which included the forced removal of thousands of Jewish residents of the area. Israel got rocket attacks in exchange. However, Netanyahu said, Israel remains willing to restart negotiations with no preconditions.